← Is This Story Funny or Serious? We were entering the Kindergarten classroom that was prepared with written messages on paper tablecloths, plates of cookies and boxes of juice. This reception followed the concert we had just attended. My reason for coming was standing next to her written messages. She was playing the role of an adult host telling those of us who were her family to sit anywhere. As I bent down to tell her how proud I was of her my eyes caught the message on the tablecloth beside her. 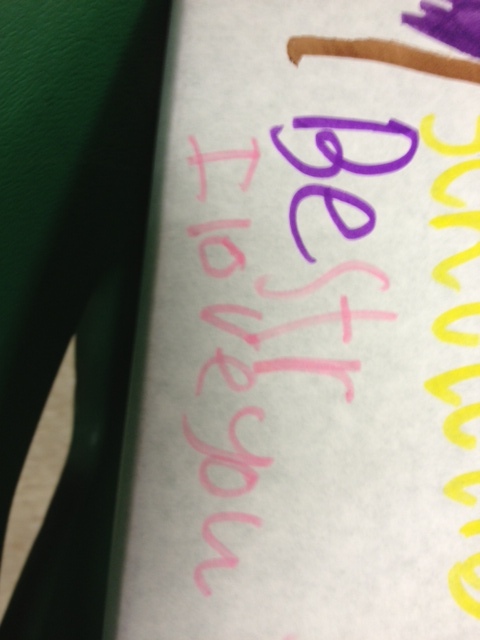 My heart jumped as I recognized that she had written, “Besta, I love you” in preparation for my coming. “Lord, open my eyes to your messages of love to me today. Help me to recognize that you have written, “I love you” all over the story of my life. This entry was posted in Stories and tagged Besta, classroom, concert, God, grandchild, I love you, Kindergarten, Lord, love, message, preparations, story, writings. Bookmark the permalink.